International Space Station commander Barry WIlmore installs the orbiting lab's first 3D printer on Nov. 17, 2014. A new era in human spaceflight and exploration has begun, advocates of 3D printing say. The 3D printer aboard the International Space Station produced its first part Monday (Nov. 24), manufacturing a piece of itself called an extruder plate. The humble part is just the first of many objects that will be created off Earth over the coming years, helping humanity explore far beyond its home planet and even establish outposts on distant worlds, some experts say. The 3D Print project teams NASA with California-based startup Made In Space, which designed and built the 3D-printing machine currently aboard the orbiting lab. Astronauts on the space station have long been reliant on launches from Earth to bring them spare parts and replacements for things that break. This is not an ideal situation; rocket launches are expensive, and they generate intense vibrations that can shake apart delicate cargo. 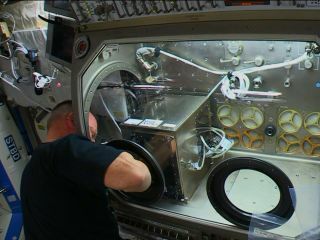 So having a 3D printer — which builds objects layer by layer out of plastic, metal or other feedstock materials — on the space station could make crewmembers' lives easier and result in significant savings, NASA officials say. For example, a recent study by the space agency found that about 30 percent of parts aboard the orbiting lab could be manufactured with a 3D printer. The technology is even more important for manned missions to deep-space destinations such as Mars, NASA officials say. "Additive manufacturing with 3D printers will allow space crews to be less reliant on supply missions from Earth and lead to sustainable, self-reliant exploration missions where resupply is difficult and costly," Jason Crusan, director of NASA's Advanced Exploration Systems Division, said in a statement. Long-duration missions would otherwise have to carry lots of spare parts to cover a variety of contingencies, resulting in higher costs. "We really want to see these things become the building blocks for the future of exploration," Made In Space Lead Engineer Mike Snyder told Space.com, referring to 3D printers. "They really can lead into sustainability in space, and actually make these missions that cost a lot of money be reduced just because you don't have to launch as much mass." 3D printing should also help humanity establish outposts on the moon and Mars, especially if the feedstock is sourced locally, from lunar or Martian materials, said Made In Space CEO Aaron Kemmer. "It starts with tools and spare parts, things like that, and eventually leads to habitats, structures and really everything that you need to live off-world," Kemmer told Space.com. NASA is working to develop and incorporate 3D printing technology on several different fronts. Last year, for example, the agency awarded a $125,000 grant to a researcher seeking to build a prototype 3D printer for food. NASA officials hope such a "3D pizza printer" could one day help feed astronauts on long space missions, such as the journey to Mars. NASA has also been testing rocket-engine parts made via 3D printing, which experts say is significantly cheaper and more efficient than traditional manufacturing techniques for such parts. NASA isn't alone in investing in 3D printing. For instance, Lockheed Martin used the technology to make some parts for the Orion crew capsule, which the aerospace firm builds for NASA. SpaceX has flown 3D-printed rocket parts on commercial launches, and the company is using additive manufacturing to construct the emergency escape rockets for the manned version of its Dragon spacecraft, which could begin ferrying astronauts to and from the space station by 2017. Further, the European Space Agency (ESA) plans to launch its own 3D printer to the International Space Station in the first half of 2015. ESA also recently teamed with industrial partners to investigate the feasiblity of using 3D-printing technology to build a moon base using lunar materials. "3D printing offers a potential means of facilitating lunar settlement with reduced logistics from Earth," Scott Hovland, of ESA's human spaceflight team, said in a statement last year. "The new possibilities this work opens up can then be considered by international space agencies as part of the current development of a common exploration strategy."